Smarter Divorce Solutions provides individuals, couples, mediators, and attorneys with financial expertise during divorce. With advanced training in all financial aspects of divorce including pension valuation, marital vs. separate property, and tax optimization of settlements, we can help craft creative settlement solutions that make financial sense for both parties. 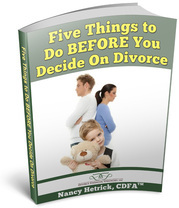 Get divorce financial planning expertise when you need it most. Mediators often struggle with properly educating a couple on the financial complexities of their settlements. Not at Smarter Divorce Solutions. Every mediator on our team is also a Certified Divorce Financial Analyst trained in all of the financial intracacies of divorce. We combine our experience as financial advisors with hundreds of hours of mediation training to offer a whole new model – DIVORCE DONE DIFFERENTLY! There’s no need to make agreements that aren’t fully informed, educated and future tested. At Smarter Divorce Solutions, we’re offering a mediation experience like no other. Facilitating communication is great, but don’t you want to be sure you have ALL of your property settlement options on the table? We provide ideas for creative settlement solutions to ensure you will BOTH be ok in the next phase of your lives. Why go anywhere else? Regardless of the reasons, you and your spouse are engaged in divorce litigation and the financial complexities are overwhelming, confusing, and you don’t seem to be getting much clarity from your attorney. Let us partner with you to ensure you make smart decisions on what you should be negotiating for. Are you sure it’s going to be enough? You might have investments, retirement accounts, pensions, businesses, expenses, rental properties, etc. How in the world do you structure a property settlement that is fair and won’t get you into tax trouble? Would you like to be able to see in black and white how a settlement would impact your future? You have come to the right place. We can partner with your attorney to help you navigate the financial waters of divorce with confidence and clarity. The Qualified Domestic Relations Order (QDRO) is prepared, sent to the judge for approval and then forwarded to the plan administrators for division of the assets. This process can take several weeks to several months and we offer a very competitive rate of only $650. We prepare QDROs at a flat fee of $650 so that you can understand all of the intricacies of your negotiation BEFORE you agree to a settlement. Our office can fill most Financial Forensic needs at a much lower cost than the big firms. Nancy Hetrick holds the MAFF™, Master Analyst in Financial Forensics through the National Association of Certified Valuators and Analysts and is trained in Lifestyle Analysis, Separate Property Tracing, and search for hidden assets. She can also assist your case with analysis of expenses run through a business or uncovering potential hidden assets through a Lifestyle Analysis. When your case needs a Lifestyle Analysis or Forensic Accounting for a divorce, you can count on Smarter Divorce Solutions to fill that need in a cost-effective way. Your divorce is final! Now some of the real work begins. Your accounts need to be consolidated, QDROs completed, bank accounts closed, wills redone, etc. It can be very overwhelming! Let us help you with all of those things after the divorce in order be sure you don’t miss anything important so you can begin the next phase of your life with confidence and control. As a Wealth Manager since 1999 and Certified Divorce Financial Planner with years of experience, Nancy Hetrick and her team from Smarter Divorce Solutions are equipped to help you manage your financial life post-divorce to ensure that your financial plan has the best chance of success. Nancy, Leslie and Andrea are full-service financial advisors with Better Money Decisons. Make sure that you have a clear vision for your new life post-divorce. We have coaching programs that can help you form and achieve your financial goals. Whether you need help with simply planning a budget or you want to move through some money blocks that stopped you in the past we can help you reach financial clarity. Better Money Decisions was built on the foundation of superior service and a sincere desire to help clients make critical decisions as they navigate the transitions into the various stages of their lives. We put our expertise and vast experience to work for you as your partner throughout the many decisions that affect your financial life. Every financial decision has an emotional impact and we appreciate the fact that sometimes emotions can outweigh the dollars and cents. We’ll help you sort through these decisions, as well.